Moving to the foothills from the flatlands, an aged knee signaled was time for a boost up hills. The installation of a kit was not to be taken lightly. 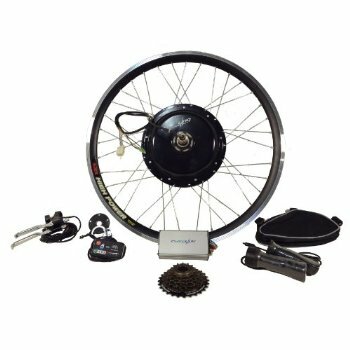 Basically there are 3 types of E-Bike Kit propulsion systems shown below with a couple bullet points. 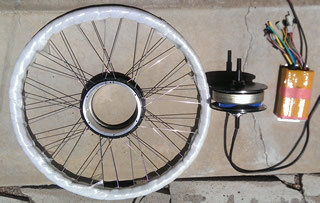 Simple low cost solution that lead the way for the E-Bike revolution. Adding a set of planetary gears significantly improved low speed efficiency. 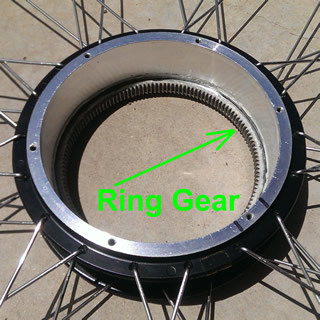 Adding a one-way clutch eliminated the cogging drag. Crank motors rapidly emerged as they offer the ultimate in efficiency and weight. 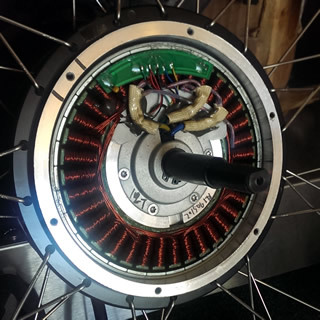 Dual clutch system allows proper motor freewheel. Efficiency is an important point; batteries have the highest portion of weight and cost in an E-Bike system. While there are some really nice Direct Drive hubmotors the choice came down between the Geared Hubmotor and a Direct Drive. One of each was ordered. 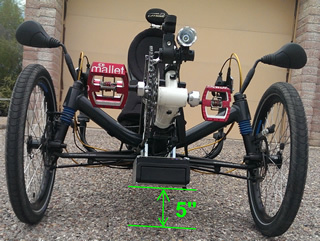 Optimal battery position for stability is at the lowest position between the front wheels. A rectangular case style battery was mounted below the boom; 48 volt, 10 amp-hours, LiFePO4 at 13 lbs. 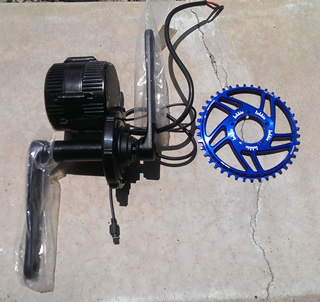 The Geared Hubmotor is a MAC 10T, with a 40 Amp Infineon Controller and a Cycle Analyst 3. The battery needs to be large enough to provide the desired range with a stout output in Amps for best performance. LiFePo4 chemistry offers 2-3 times as many recharges as any other Lithium. 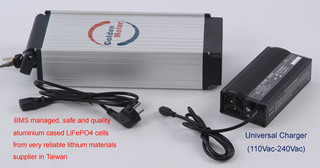 Golden Motor builds a great battery at a reasonable price. Battery was mounted below the Boom between the tires fore & aft. This enhanced the stability with mass down low. The battery is mounted to a slide with a key lock. The slide is mounted with custom fitted circular ABS collars and clamps. With 5.0" ground clearance the battery is out of harm's way. 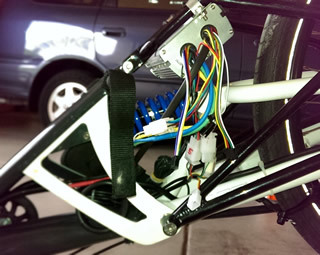 The MAC 10T came with 14 Ga spokes and an Alex 26" rim with motor & 40 Infineon Controller. Infineon is a German technology company that manufactures drive systems in China. Field Effect Transistors (FET) switch the poles. 3077 is the part number of the most efficient FET's available and can reduce power loss by about 3-4% on an average ride, more on hills. The Mac 10T is a pretty stout motor. 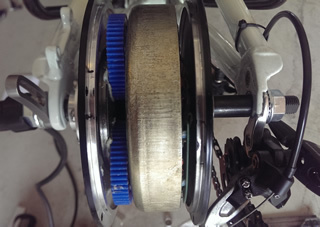 The hub is fitted with a Ring Gear which is driven by the blue planetary gears on the motor. The motor has enough copper to handle the higher watts demanded on hills. The motor spins 5 times faster then the rim boosting efficiency over Direct Drive by 20% with heavy loading or at lower speeds. The green circuit board has 3 Hall Effect switches and a temperature sensor that need to be connected. The Mac seems to endure about 1500 watts at speeds over 15 MPH pretty well. Not bad for a 10.2 Lb motor. 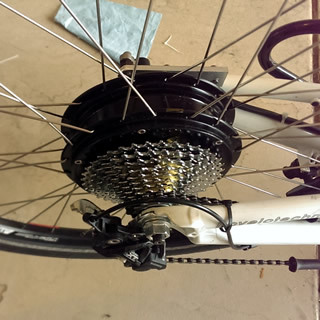 Its a good time to point out that most Hubmotors use screw-on freewheels rather than Freehubs with splined cassettes. Sunracer 10 speed 36-11 freewheel was fitted. Most 135mm motors were designed to handle 8 speeds and the 10 speed adds 3mm. The swing arm can be spread about 3mm without too much trouble. On this motor 2 mm was removed from a spacer that allowed it to fit without any trouble on a 135mm swingarm. 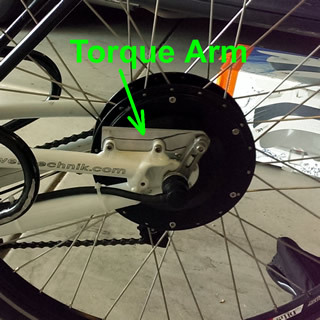 Torque from the motor requires a stout torque arm - this one attaches to the caliper mount. First ride, first impression; WOW! Twist the throttle fully from a start and the rear wheel struggles for traction. 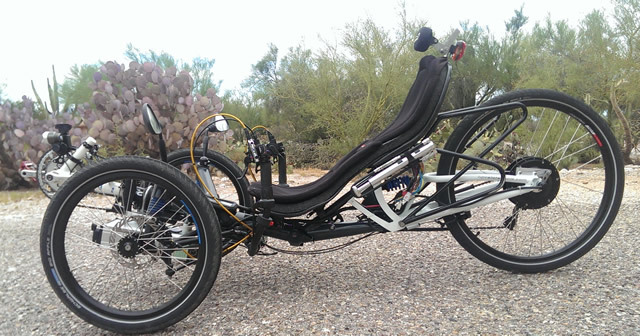 It will cruise at 27 MPH without pedaling. Climbs long 15% with ease; up to 20 MPH without pedaling. With power off you can feel the weight but no drag from the motor. At all. The Mac 10T kit came with a twist throttle and cruise control. When you set the cruise control it attempts to maintain the speed it was set at. Very easy to use. Over a 17 mile test run included over 1000 feet of climbing. Mostly under battery power with an average speed of 17 MPH it consumed 6 of the 10 amp-hours of battery. Over the same course using normal pedal output and the motor only for a boost up hills the average speed was 12 MPH and consumed 1.5 amp-hours. For my intended purposes it has a range of 50-60 miles. It is not silent, nor is it loud. It makes slightly more noise then a Rohloff but not much more. Next up is adding a Cycle Analyst and Thun Torque Sensing Bottom Bracket.